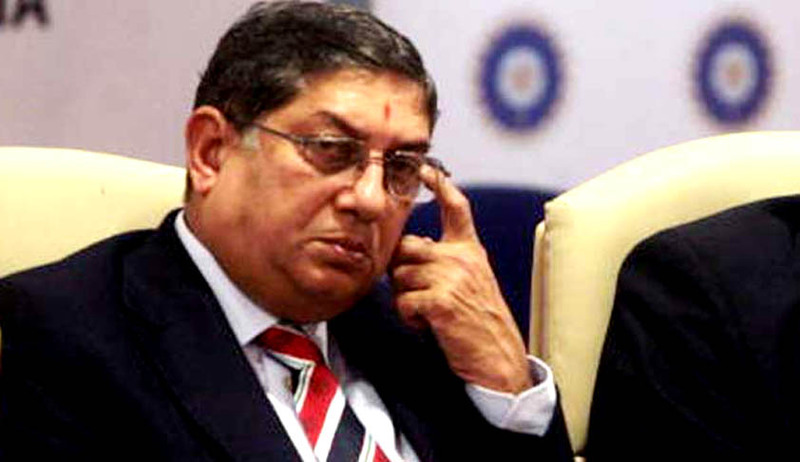 A Supreme Court bench headed by Justice A K Patnaik stating that there were very serious allegations made in the report against BCCI president N. Srinivasan asked him to step down for a free and fair investigation in the betting and spot-fixing scandal involving his son-in-law Gurunath Meiyappan and some cricketers as unless the BCCI president steps down, no fair inquiry can be conducted. The bench further stated that if the BCCI president does not step down from his position, the court would pass an order. The bench asked BCCI counsel to go through certain paragraphs of the report as, according to the court the contents of the report, which also raised doubt on the role of six Team India players in IPL betting and spot-fixing scandal, cannot be disclosed in open court. It said that considering the essence of the report, the allegations have to be investigated and asked the BCCI counsel to take instructions and posted the matter for further hearing on March 27. During the hearing, BCCI requested before the court not to divulge the contents and names of players mentioned in the report. As Live Law reported earlier, in a probe conducted by Justice Mukul Mudgal committee, Gurunath Meiyappan, the son-in-law of BCCI president N Srinivasan and team official of Chennai Super Kings, was alleged to have indulged in betting and passing on information during IPL 2013. A report of the three-member committee presided by former Punjab and Haryana Chief Justice Mukul Mudgal declared that the role of Gurunath Meiyappan in Chennai Super Kings (CSK) as the team official stands proved and the allegations of betting and passing of information against Meiyappan stand proved. The committee, also comprising Additional Solicitor General N Nagehswar Rao and Assam Cricket Association member Nilay Dutta, however stated that the allegations of fixing require further investigation. The committee was appointed by a bench of justices A.K. Patnaik and J.S. Kehar to investigate the charges of betting and spot fixing against Meiyappan and owners of Rajasthan Royals. Live Law further reported that according to the committee Meiyappan violated several sections of the IPL Operational Rules, the IPL Anti-Corruption Code and Articles of the Code of Conduct for Players and team officials. The “conclusions and recommendations” section of the report said that it can do no more than report a “violation of the rules” to the Court as it does not have a mandate to impose any punishment. It was for the Hon’ble Supreme Court to decide what action, if any, is to be taken pursuant of the report of the Committee. In furtherance to that it considered that, “while it is evident that the questions raised before us about conflict of interest are serious and may have large scale ramification on the functioning of cricket, we do not deem it proper to pronounce our opinion on this issue as it is not directly in our terms of reference” and hence concluded, “it proper to bring this issue to the attention of this court”. During the course of hearing on the report of Justice Mudgal that went into the allegations of betting and spot fixing in the IPL, Justice A.K. Patnaik said Srinivasan has to step down for a fair investigation into the allegation of betting. As senior counsel C.A. Sundaram sought to defend the action by the BCCI, Justice Patnaik asked him to go through the report to get to know the seriousness of the allegations but not as an advocate of Srinivasan or BCCI.